We appreciate the overwhelming, outpouring of support following Hurricane Harvey. 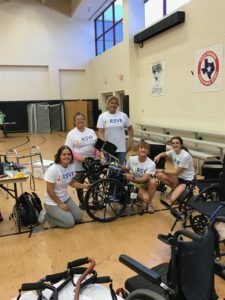 Communities across the country have come together to garnish support for members of the Houston community with health problems and physical disability. We are experiencing the generosity and warm-heartedness of strangers across the country, and we couldn’t be more thankful. The Houston community has experienced an influx of need for medical equipment after the hurricane. During the storm, individuals were often unable to bring their mobility devices and other equipment with them as they emergently evacuated their homes. Additionally, the flood waters caused extensive damage, resulting in loss of medical equipment. Hurricane shelters are reporting shortages of a variety of equipment. RSVP is working to fill the need by collecting and distributing DME. RSVP is 100% staffed by volunteers. We are actively looking for local volunteers to assist with a variety of duties, including staffing our equipment drive, accepting deliveries of equipment from mail services, organizing our stock for distribution, transporting equipment to recipients and shelters, and language interpreting. We are hosting equipment drives at West Gray Multi-Service Center (address: 1475 W Gray Street, Houston TX 77019). We are seeking donations of medical equipment. Please, scroll to the bottom of this post to review lists of needed items for donation.